So, let's take a look at this month's vapid cover blur... waitasec... "10/10"? Ten out of... are ya, are ya kidding me here? Okay friends, real talk here, comics as an art form and industry have been around for, what, eighty-odd years? In that time, there's probably been... I dunno a dozen, maybe two dozen "Perfect 10" issues. 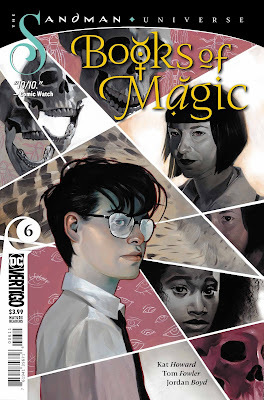 Lemme tell ya... Books of Magic, Volume Three, Issue whatever ain't one of 'em! Reviewers, we really need to dial it back when slinging these "Perfect 10's". At this point, they been rendered completely meaningless. I get that it's supercool to get a pro-retweet... and free swag is swell, but we really need to take a step back and remember what reviewing is supposed to be all about. We're not doing this to placate creator egos, or curry favor with publishers. If that's all you're worried about, you're doing it wrong. You're not helping anybody (except yourself)... and in fact, I'd suggest that you're only making things worse. Remember... If everything's a 10/10... then nothing is. 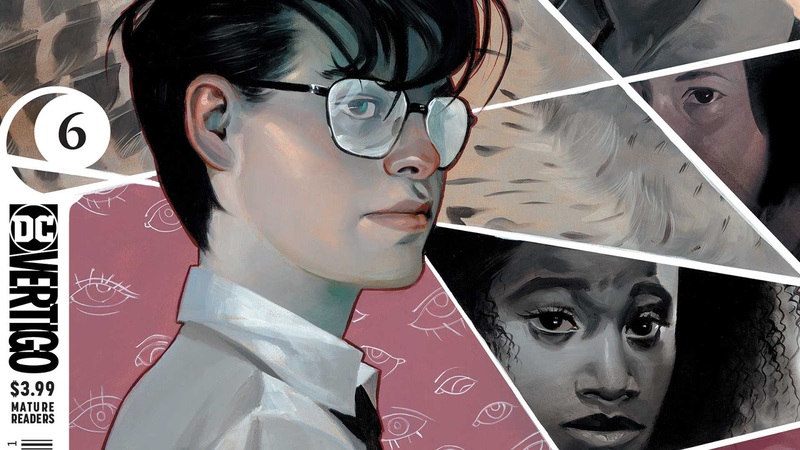 Books of Magic proves to be the second book from the Sandman Universe imprint to buck the trend of the sixth-issue conclusion. That is to say, if you thought this would tidily wrap up everything we've read so far, you're going to be disappointed. All's not lost, however... I'd suggest what we do actually wind up getting is far better! Tim's back in the mundane world... and if you ask me, not a moment too soon. I was fearful that we'd spend half the book with Tim and Yo-Yo trying to find their way out of The Dreaming. Given the heavily-decompressed nature of the arc to this point, I was just about certain that would be the case. Things in the mundy world, however, are anything but. If you recall, the girl Tim's been sniffin' around has been nyoinked into a magic book... and one of his teachers murdered (and kept the skull of) another! Oh yeah, and his mother's still out there... somewhere. Our Timothy has himself a full-plate (literally and figuratively), and finally, after six-issues... and some twenty-four pre-tax bucks... it feels like we have some wind at our back. There is actually so much presented during this issue that Tim's forced to prioritize which spur to investigate first. It's quite well done, and the lad's decision-making rationale is solid. This is still what I would call a "breezy" read, but it's the first time in a couple of months that I didn't feel like I was wasting my time with it. These opening chapters have been decompressed to almost a painful extent... where the discoveries and decisions Tim made during this issue would have been far more welcome in, say... issue #3. The art is still strong. The style (facial-expressions especially) is really growing on me. I wasn't sold on Fowler when we started this journey, but now I'm fairly certain he's the only one for the job. It feels like the missing piece of the Books of Magic puzzle fell into place with this issue... forward momentum. I'm back to feeling optimistic about the direction of this series!